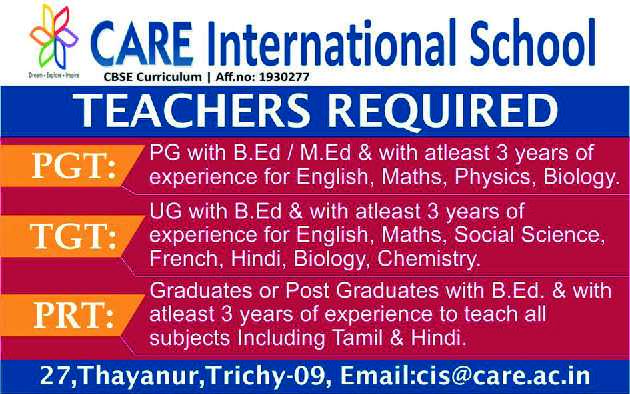 CARE International School, Trichy has advertised in THE HINDU newspaper for recruitment of Teachers PGT / TGT / PRT jobs vacancies. Interested and eligible job aspirants are requested to apply immediately from 23rd January 2019. Check out further more details below. About School: Care International School believes that education is a lifelong process and prepare our students to adapt, adjust and evolve as they fulfill their duties and roles as world citizens. The vision of the school is to prepare our students for a rapidly changing world by equipping them with critical thinking skills, global perspective and respect for core values of honesty, loyalty and compassion.